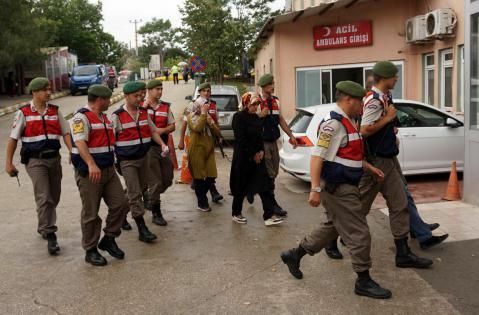 Four people have been detained in the Keşan district of Edirne province while attempting to flee to Greece in a bid to escape a post-coup witch-hunt currently ongoing in Turkey, the Cumhuriyet daily reported on Monday. According to the report, a surgeon, Mehmet Ali Yılmaz (34), and a physician, Meryem Dağdelen (31), who were both fired from their jobs by government decree; and Hatice Çelikcan (45) and Murat Yılmaz (45) were caught by gendarmes as they were trying to flee to Greece. Dağdelen and Çelikcan reportedly wanted to go to Greece to reunite with their husbands. Thousands of people have fled Turkey due to a massive witch-hunt launched by the Justice and Development Party (AKP) government against the country’s dissidents and sympathizers of Turkey’s Gülen group in particular since a failed coup attempt on July 15. The government accuses the group of masterminding the coup. Arrestees include journalists, judges, prosecutors, police and military officers, businessmen, students, teachers, academics and governors.